I have an old 6” Craftsman Contractor Jointer my dad gave me this past year. I’ve fixed it up and have been using it with much success. I would like to be able to take guard off and joint the faces of 8” boards and then finish them off on the planer (with a piece of plywood underneath as a sled). If you don’t know what I mean, see this youtube video. Anyway, this jointer has a roll pin under the guard so the guard will stop when pushed away from the fence (so it won’t rotate too far and possibly damage the guard spring). 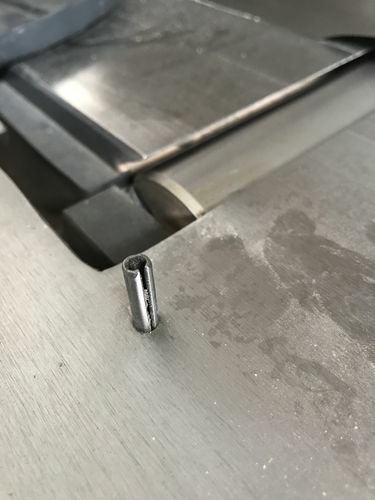 I haven’t tried tapping this roll pin out as I don’t know if the other side is intentionally mushroomed to prevent it from coming out (I tried to take a pic of the underside as it’s hard to see). 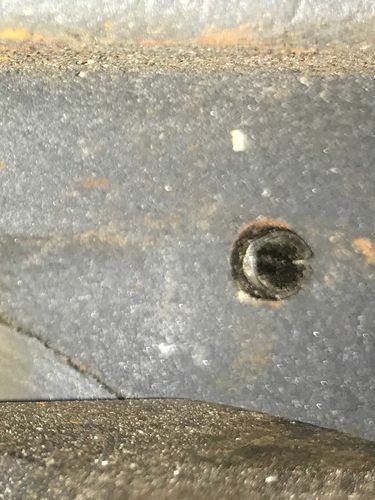 I could try to take the roll pin out and put it back in each time I want to flatten a board wider than my jointer, but I was wondering if anyone had any ideas for me on what to replace the roll pin with so I could more easily remove it next time I want to do this. I was thinking of a small bolt with several nuts (on top and bottom) to replace the roll pin with. Would this work? 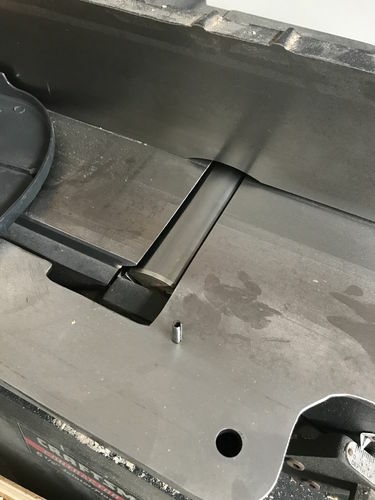 If I take the roll pin out and try to keep it intact, then I may have to end up taking the whole infeed table off – an endeavor I’d rather not have to do each time. Here are some pics of the jointer. I would drill a small hole in a thin piece of plywood and put that over the pin, then grab the pin with vise grips and just start wriggling it out. Since you’ll never joint a board wider than 6 inches it isn’t really needed. And when you do want to go wider than 6 you’re going to pull the porkchop off anyway. I would drill a small hole in a thin piece of plywood and put that over the pin, then grab the pin with vise grips and just start wriggling it out. Since you ll never joint a board wider than 6 inches it isn t really needed. And when you do want to go wider than 6 you re going to pull the porkchop off anyway. Thanks. I guess I didn’t realize that pin is there to keep the guard from opening up wider than 6”. I assumed it was there so the guard spring didn’t receive too much tension… but six of one, half dozen of another I suppose. I would take the spring pin out and tap the hole so you could quickly remove a hex cap or socket cap screw as many times as you needed to without having to mess around pounding out the pin any more. Thanks for the link Bill!